Inspired by @lizlosh's thread, I've like to open a thread to the discussion of source code in the HBO serial Westworld. This thread will be full of spoilers, so if you haven't seen the show, please, stop reading now. The producers of the show are clearly aware that this code will be read by viewers who can pause, screenshot, zoom, et cetera. 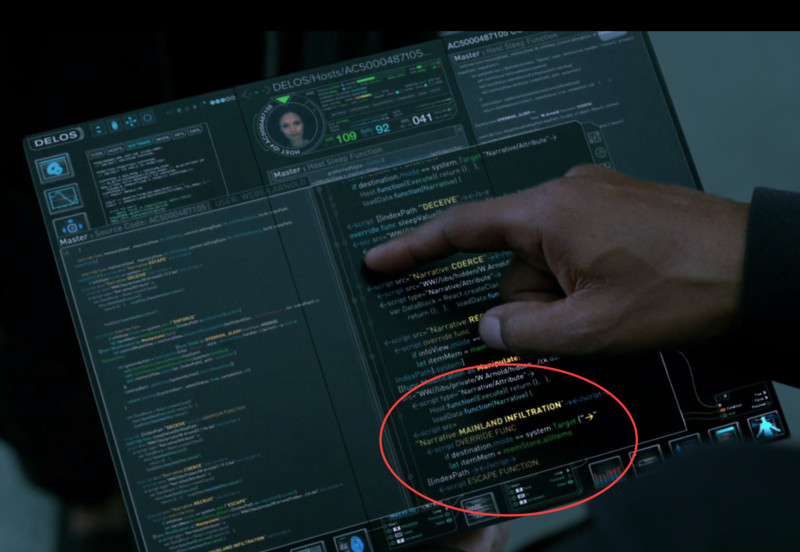 I'm most interested with the relationship between Maeve Millay (Thandie Newton), the android (host) who runs (perhaps a poor choice of words) the local brothel, and her own source code. Her radarchart of personality traits has also been simulated. What do these representations of code say about our conceptions of code? Needless to say this is a fraught topic. Maeve is an android host built to be a woman of color who runs a brothel -- although I suspect each of those elements were chosen because they were so fraught and to serve up sexual fantasies for a white male-gaze. 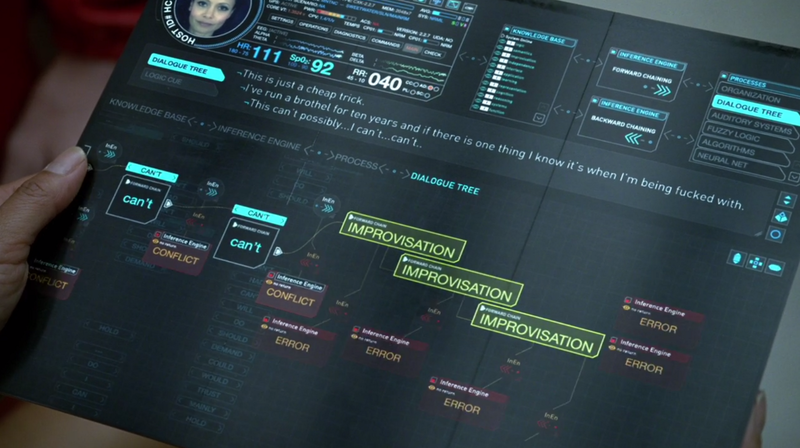 That said, I'm still interested in representations of code and the idea of a programmed being's relationship to their code, especially since Maeve seems to oppose her own programming. Of course, I would also like to bring this representation of code to the intersecting explorations of gender, race, and creativity that make up our WG this year. Definitely guilty of pausing to parse the code! When I spotted React, that got me thinking both about React's approach that makes use of a 'virtual DOM' and also about its makers at Facebook. Maybe the easier inclination when engaging with science fiction is to imagine oneself still more human, guest not host, but could React draw a throughline from the seemingly tame virtual selves and spaces seen online now to speculative AI selves and spaces? At which point a host rewriting her own code nicely emphasizes the blurry configurations of HCI. I had two talented undergraduate researchers this past summer -- Juliet Way-Henthorne and Annette Ding -- who were working with me on my Transverse Readings project mapping narrative branching pathways in the Katz Gamebook Archive. Each student researcher wrote a different short research report on selected works from the collection that were narrative choice maps in genres such as interactive romances or fantasies with female protagonists (ostensibly targeting female readers). When female readers and female characters are given a branching tree of choices, what choices are offered, which are chosen, what are the outcomes? Their write-ups each contain example graphs from the project.